Recently, the incidence of gastroesophageal reflux disease (GERD) in Thailand has been increasing. Less was known regarding the outcome of laparoscopic antireflux surgery in Asian.The aim of this study was to report our initial outcome of GERD patients who underwent laparoscopic Nissen fundoplication. Method: Twenty patients who underwent laparoscopic Nissen fundoplication were included. All patients had been prospectively interviewed for grading the severity of GERD symptoms using a standardized questionare before and after operation. All patients had preoperative upper GI endoscopy, esophageal manometry and 24 hr pH monitoring. Laparoscopic Nissen fundoplication was done in the standardized fashion. Results: Of20 patients, 17 were positive for pH study. All patients underwent laparoscopic Nissen fundoplication. Postoperative was uneventful in all patients. Median hospital stay was 3 days. All patients were prospectively interviewed for GERD symptom at the mean duration of 18.5 months postoperatively. Postoperative symptom score of heartburn (p=0.004), regurgitation (p=0.0004), abdominal pain (p=0.0001) and belching (p=0.003) were significantly improved comparing to those of preoperative symptom. On the other hand there was no difference in dysphagia symptom score (p=0.13). Median %time of distal esophageal acid exposure was 10.1 preoperatively and 0.4 in the postoperative period (p=0.006). All 17 out of 17 patients with positive pH test and one out of 3 patients with negative pH study were satisfied with the result of the operation (90%). All patients have never taken PPIs after surgery. 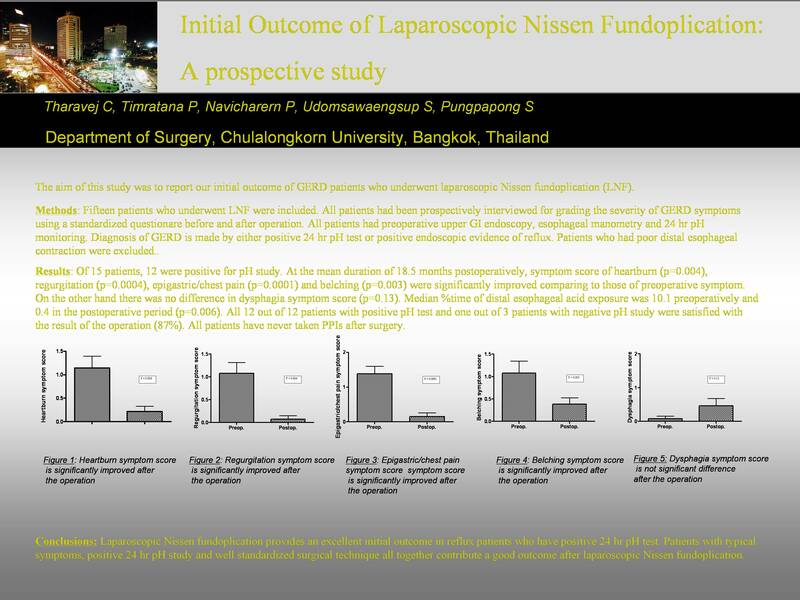 Conclusions: Laparoscopic Nissen fundoplication provides an excellent initial outcome in reflux Thai patients. Patients with typical symptoms, positive 24 hr pH study and well standardized surgical technique all together contribute a good outcome after laparoscopic Nissen fundoplication.